I've just learned that the levels of acidity in our body affect our health greatly -- too much acid in our systems leads to illnesses, aging, and gives cancer cells the perfect environment to grow. According to my naturopath at Wellness Guru, most of our everyday foods are too high in acid, so not only should we avoid those foods, we should increase our alkaline intake. This recipe is an alkaline broth that I've been making almost daily and sipping on throughout the day. Give it a try! Your health will benefit enormously. Bring the water to a boil in a medium-sized pot. Meanwhile, chop all the vegetables and slice the ginger; add to the pot. You can also add a few slices of lemon, or squeeze in the juice of a lemon wedge at the end. Simmer on a low boil for half an hour. Store hot in a thermos and consume throughout the day. Makes about 4 cups. NOTE: I call this a vegetable "tea" instead of a broth because it's almost flavourless, except for the lemony ginger and only a slight hint of vegetable taste. Have plain, or experiment trying with a bit of honey, or alternatively a dash of salt and pepper, up to you. KAPHAS benefit from not too much liquid throughout the day, so consume this tea (hot or warm) in place of juice, tea, etc. This looks so tasty I went out and bought the ingredients and it's on my stove right now! It smells divine! Can't wait to taste it. Thanks so much for all the info you are providing!!! 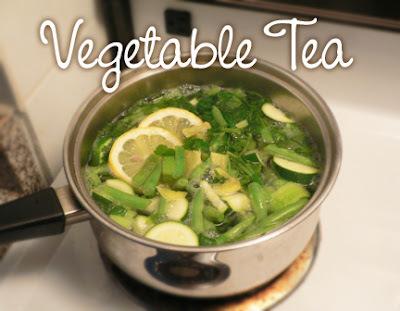 The idea is to have high-alkaline vegetables in the tea. I think maybe you have these available in Japan to substitute zucchini: choose either sweet potato, turnip, daikon, cauliflower or cabbage. Hope this helps! Frannie-san, thanks so much for your help! I've eaten a basic Vata diet for many years, just because it works for me, but I really am just beginning to study the principles now. I love your blog and your generosity in sharing what you know! Several years ago you could find liquid chlorophyll as a food supplement. Given the large number of "green" ingredients for alkaline veggies, I wonder if it would have similar effect? Hmmmm . . .